Manufacturer: Game Development Group Inc. Publisher: Game Development Group Inc.
Attributestudio: Game Development Group Inc.
Label: Game Development Group Inc. Studio: Game Development Group Inc.
Players have 30 seconds to stare at an image on a card. Images are varied and fun for kids to look at. What was the clown holding in his left hand?. What color is the girl&apos;s party hat?. Kids can play individually or in teams. In STARE! 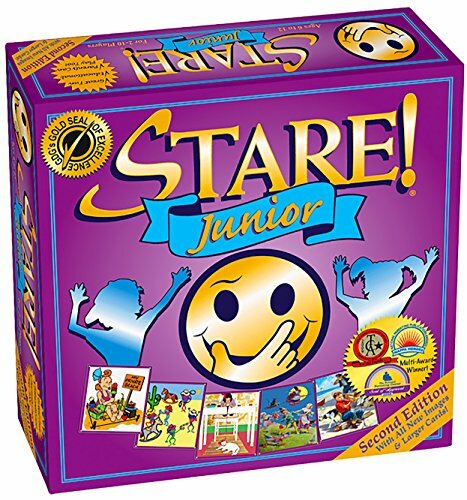 JUNIOR - the board game - kids can test and train their visual memory skills and have a blast doing it! Players have 30 seconds to stare at an image on a card. Images are varied and fun for kids to look at. It might be a movie poster, funny photo, comic, work of art and more. When time is up, an opponent will flip over the card and ask the player a series of questions about the image to see how much they can recall. What was the clown holding in his left hand? What color is the girl's party hat? Guess right and advance on the game board. Kids can play individually or in teams. Great for family game night! The revised Second Edition has larger cards with all new images and questions. Includes image cards, game board, sand timer, playing pieces, die and instructions. - Great Fun for the Whole Family! Manufacturer Game Development Group Inc. Publisher Game Development Group Inc.
AttributeStudio Game Development Group Inc.
Label Game Development Group Inc. Studio Game Development Group Inc.